Who doesn't love hearing reports of New Order victories? As the Father of the New Order and Saviour of Highsec, many Agents send their reports directly to me. 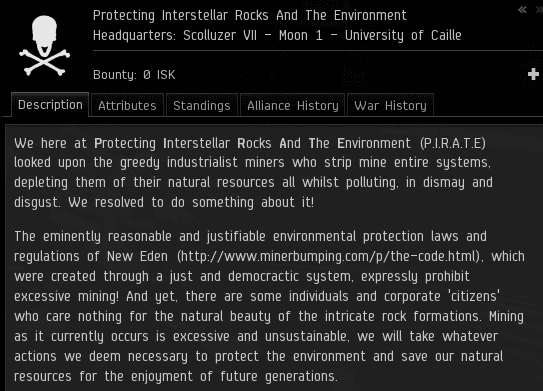 On occasion, I get reports of New Order victories from a different source: the rebel miners themselves. My inbox is filled with EVEmails like this one from Awol Soilder. Every time a carebear says "I would've paid! ", an Agent gets his wings. Or her wings, as the case may be. The complaint about "tisi" could refer to no one but Tisiphone Dira, a strong, powerful Agent. 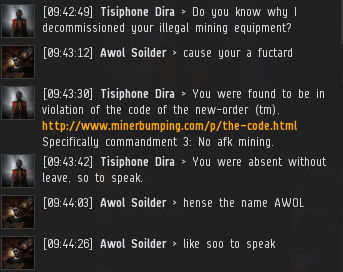 She ganked and podded Awol Soilder for the crime of AFK mining in a Hek asteroid belt. Awol Soilder accepted Tisiphone's post-gank convo request, but it was obvious his heart wasn't in it. He didn't really want to chat, I think. The miner had no one to blame. He'd set himself up for failure from the moment he chose his character name. 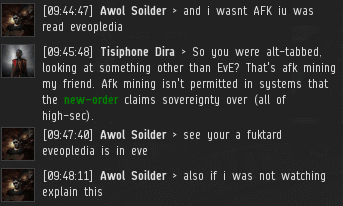 Awol Soilder spent the entirety of his year in EVE mining in highsec. 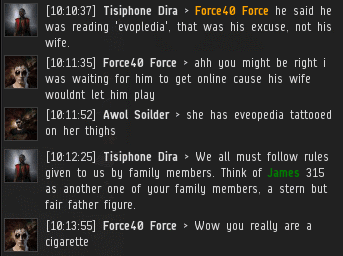 To Tisiphone's surprise, the carebear had a novel excuse for being AFK: Evelopedia is a part of EVE. This is a dangerous notion. If it catches on, the well-meaning website could lead countless miners to ruin! Until the New Order gets a page in Evelopedia, it cannot be considered a true part of EVE. All other EVE-related resources--the official forums, news websites, blogs, etc.--have the New Order everywhere. We're as relevant as it gets. Tisiphone recommended Awol write a petition to me. Apparently that's why I received the EVEmail. Although, as a petition, it wasn't as respectful and well-written as one would hope. Meanwhile, Awol Soilder invited Force40 Force, his corpmate, to the convo. Force40 served as Awol's "wingman" for the convo. Unfortunately, everything he knew about being a wingman, he learned from highsec mining. If Force40 had been a true friend, he would've helped Awol purchase a permit. Instead, he only cluttered the convo with nonsense. As you might have guessed, there's little culture to be found in the Hek mining scene. With his confidence boosted by his wingman, Awol Soilder pulled the "I have 6 other identical ships anyway" line. And Force40 came up with his own excuse for Awol Soilder's AFK mining habits. Unfortunately, Awol had already gone with the "Evelopedia" alibi. The carebears' web of lies came crashing down in front of their eyes. Only the Agent of the New Order remained, standing tall and true amidst the wreckage. It was then that Awol and his buddy came up with a dastardly plan to trap Tisiphone. They brought their Capsules into the asteroid belt where CONCORD was still on patrol, and they dared Tisiphone to pod them. Awol warned two local miners, who were also in the belt. One of the two miners, Alexis Smythe, was a member of a New Order loyalist corporation. Alexis immediately relayed news of CONCORD's presence to Agent Tisiphone. (Eyes and ears everywhere!) Awol and Force40 continued their taunts in local, believing themselves totally safe. But safety is to be found only in the Code. Using Alexis as a warp-in, Tisiphone landed next to the pods. Her guns divided into two groups, she killed both pods in a single burst of fire, right under CONCORD's nose. It was glorious. Tisiphone was victorious. And the Code gained much acclaim that day, as every other day! Well done Tisiphone Dira and Alexis Smythe! A fine example of teamwork; a crushing blow to two mouthy carebears. And yes E1, their corp does seem rather, rebellious. Also, I have spotted these two getting into contact with other non-compliants, plotting against the new order. Somehow though I get the feeling that we are quite safe from the machinations of these two particular rebels. Two blokes fooling around in pods. Dangerous behaviour like that gets people killed. Can the next blog post be about CODE agents rescuing the cat who got stuck in the tree? Wow, I am sorry. I woke up on the wrong side of the bed again and am going to loudly argue with myself for the next twelve hours. I sense a lot of hostility from you. Remember the immortal words of Yoda "Fear leads to anger, anger leads to hate, hate leads to suffering, suffering leads to epic tear threads." In all seriousness, what are you afraid of brother? The game is the game, it's mechanics are deemed balanced by the creators and it can't be changed, but the game can be replaced by the player. You can change how you play or you can play something else. 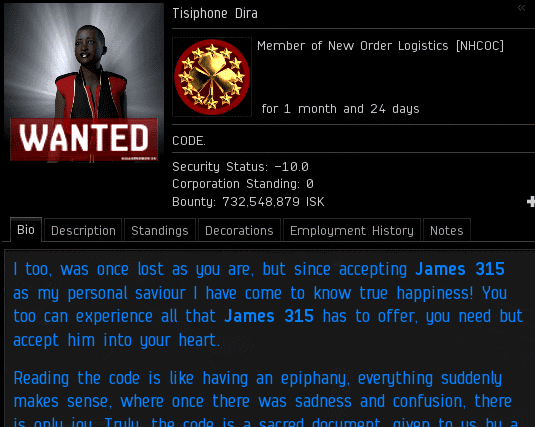 James 315, praise be his name, is in his rights to claim all of HighSec as his territory and use his followers to enforce it, and make just laws for his people to obey or not to at their own peril. Just like the carebears are free to unite together behind a single flag and fight back in an organized fashion. I'm just saying it's a sandbox, anything could happen. 1. You can get a permit and follow the Code and run incursions/mine/mission run/wage corporate wars/transport goods in HighSec in peace. 2. You can join us: read the Code, learn the deeper meaning and help us spread the word. My monastic order is recruiting just for this purpose and would welcome you after your repentance and baptism. 5. or the last option which is... Quit EVE. What other choices are there? I hope you choose to join us in this just cause: to fight in the name of the Lion of HighSec, James 315. The mechanics can be changed. It's up to CCP, not the player. How about (6) Continue to mock CODE for the failed incursion gank campaign, loss and permaban in the alliance tournament, and general lack of intelligence. 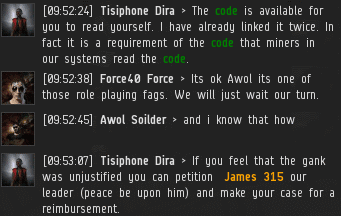 Call out their attempts to commit real life humiliation/harassment, and advocate for change on the Eve Forums, all the while being unaffected by CODE because they prefer to shoot at ships that don't shoot back? Very well said, Brother Roland. James 315 has truly given you the gift of oratory. Alas, not all carebears may be saved. Do not let it discourage you, and always remember: our Lord James 315 sees and approves of all you do in His name. I think Veers is just jealous & has a need to post contrarian commentary about absolutely everything to make himself feel good. Funny, but also kinda sad really. than, and the dead goons weren't in provi, bro. And to anonymous blog oster at 8:54 pm afraid to post with his main - To recap, I did not engage with CODE, they engaged with me. Since that point, and because they demand that I comply with their failed ideology, I have been forced to repeatedly highlight their significant shortcomings ("winning" the AT, incursion ganking, poor grammar, game exploits, emotional abuse, etc...). That ain't no victory for the Code. Sounds like you are actually going with option 3. You never did answer my question by the way, so let me take a stab at it. You are afraid the Code is going to ruin incursions for you. If you think that, it is simply not true. Get a permit, follow our Savior's Code, enjoy the game. It is the plan of happiness in EVE. 10 mil is a small tithe to pay, but the rewards are far greater! You just need a mustard seed of faith to make that first step. No, I'm not going to waste my time fighting the CODE when I think they are exploiting game mechanics to give them an unrealistic and unfair edge. So 3 is inapposite. I'm not afraid the Code is going to ruin incursions - the incursion threats were always a joke. I am kind of disappointed at just how pathetic the efforts to gank incursion runners have been. They are so poor that even when I was offered a permit, for free!, I felt compelled to decline it. And bro, I lead the resistance, a permit (which I don't want), would run me 30 mil. And give my stature, 30 bil would be more appropriate. It's unfair. James 315 conceived, founded and leads the most important player organization in the game and I whine a lot; we both do stuff. Clearly, I deserve to be mentioned in the same breath with the Savior of Highsec. Everybody should take my opinions seriously. I'm Beers Veldspar and I approve this message. Erotica 1 is a martyr for the sandbox. The drama around her ban generated significant funds for ganking miners and haulers. It also served as inspiration for more New Order fans to start ganking. Ask Ripard Teg how he's coming along on those reimbursement requests. Ripard may have gotten Ero banned. But Ero's fans made Ripard quit. Think about that for a moment. Ripard Teg quit? Stop getting your information from ze Goons. He did. He quit Eve for awhile and took his blog down. Alot of his friends were mad at him for being a prick. I wish I would have recorded corp comms when he was blathering on about it. He's come back but he's a mess. I wish he'd just come clean and apologize, he'd feel better. He did the right thing, why should he apologize? 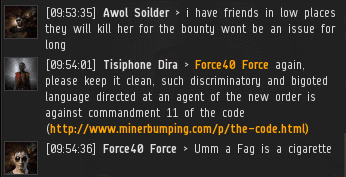 Ripard Teg is one of the biggest douschebags in eve online who got a good person banned and he knows it. Even Erotica's marks liked Ero. As soon as I'm director, I'll show him how I really feel. It's adorable. Not involved with anything, had nothing to do with anything, but of course - VERY STRONG opinions about things he was left out of. Anon, if you are going to malign decent people be brave enough to post with your name. DJ - I listened to the soundcloud, or as much of it as I could stomach. Forcing a person with a speech impediment to read out loud, to sing, humiliating him in any way possible, stealing all of his Eve assets, and stringing him along to make him think he could "win." Utterly despicable, sadistic, emotional abuse. A real nauseating experience - that's what Code is really about. It's not about Eve, it's about using the game to emotionally torture vulnerable people, and at that, I must opine, you are quite talented. yeah, as his corpmate i'm really gonna do that without roles yet... dumbass. Well, considering your talent for anonymous online smearing I'm sure you will do well in Eve. Perhaps you should consider becoming an agent of the New Order? Oh dear. Did I again mistakenly said that miners can not shoot back? Wonderful story, great job agent Tisiphone Dira! Quick thinking Tisi! Rebel scum defeated, yet again! I take it this corp needs an audit. Yeesh. 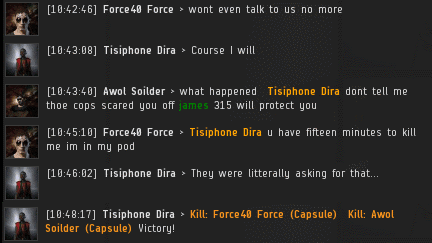 If I saw someone shitting up local with "bet you can't kill my pod" I'd be tripping over myself to provide a warp in. Just say no to cheesing. Agent Sabriz is looking rather stupid, her campaign is a bust, and not a single kill (or even attempted kill) has been had. Why not spread your monastic order to the HQ incursion community? Why do they call it cheesing you might ask? EVE is a Sandbox isnt it? What else than ganking can Code do? Youre limited to do 1 named ganking! You break your own rules, cause you act like bots. Change to Catalyst / Vexor / Thrasher / Brutix gank a target and thats all??? Of course i would get bored if i would do always the same thing like mining in my whole EVE live, so i dont. But mining like a bot is exactly the same (if not even more than 150%) than ganking like a bot. Ganking like a bot is the only part in EVE that i can do cause iam an Agent! ill never join code : ITS PURE BOREDOM !!!! Rofl confirming the only thing any of us ever do is gank, and all the verified kills and other things we do that are well documented are just an elaborate plot by The Mittini in order to fool valuable pillars of content creation in EVE such as "Random anonymous blog poster". You don't have to join Code! 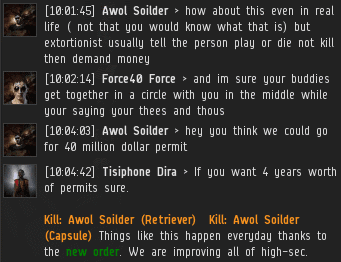 Get a permit, follow the sacred laws of HighSec as outlined in the Code, and be happy. Not all playstyles appeal to everyone. I've tried mining. Doing it solo is boring; I may do it as a fleet booster/combat protection, but the actual mining is boring. I've tried missioning; that's also boring, and the most I could bear to do was a little bit to up my Caldari standing for cheaper tax rates in Jita (on my trade alt, of course.) Exploration doesn't appeal to me either; neither does faction warfare or even station trading (the Caldari standing was to get me better mineral prices for the manufacturing I do). However, I also don't like suicide ganking. Nothing against it, but it doesn't appeal to me, and I don't think less of CODE. for doing it - if they like it, that's fine. I just don't like it - a whole bunch of setup for a few seconds of pewpew, then I can't play on that character for 15 minutes? Nah, can't do that. Personally, I like Null warfare. The politics and the drama keeps me very entertained out of game, and when I have time to actually play the game (beyond updating my industry jobs that I use to fund PvP), I love to go on fleets that can sometimes be a good deal of combat (certainly more than 25 seconds). That some people might not enjoy that, though, doesn't bother me. Eve is a sandbox. Do what you want. Just don't expect everyone to play your way, and don't expect all playstyles to necessarily be compatible. That's part of what makes Eve interesting. Oh man, that was beautiful!! Way to go agent Tisiphone Dira. Do you ever wonder what would happen if you looked into a mirror in a dark room, and said the name "veers" 3 times? I do. I've lost sleep over this. you might see anonymous blog poster a 9:01 pm (and presumably also 8:54 pm) pretending to be me staring back at you in the mirror. It would not be a pretty sight, I think. EVE is a Sandbox, its ok that you play BOT games. It doesnt matter if you gank a miner alone or if you gank a Freighter with 15 in fleet. BOT is BOT it doesnt matter what a Bot is doing. And i never will become a Bot! Next time just consider a permit when operating in New Order Sov space. It's really the smart thing to do. It really is. Everyone should buy a permit to avoid losing ships. Or you could just take the Veers approach. Don't buy a permit (or even accept a free one! ), relentlessly mock the CodeBros, and still don't lost a ship. 10 mil cheaper and a lot more fun. How is mocking Code working out for you Veers? How is anything to fight code working out for you? Going great, anonymous poster too afraid to post with his in game name? How is being a coward working out for you? Less than 52 seconds before fulfilling their wishes. That's very good. This may be the first recorded incident of a player blowing up another player via gank (2 actually!) with Concord present. EXPLOIT! FOUL PLAY! Put your degree where your mouth is... raise up a new rebel army for us to crush Veers. as opposed to the "old" rebel army that you crushed? And what is the point of raising an army in highsec? It's not like you can control territory - wars are just a tool for griefing PvE corps. I smell some veers tears hitting the blog. 'DJ - I listened to the soundcloud, or as much of it as I could stomach. Forcing a person with a speech impediment to read out loud, to sing, humiliating him in any way possible, stealing all of his Eve assets, and stringing him along to make him think he could "win." Utterly despicable, sadistic, emotional abuse. A real nauseating experience - that's what Code is really about. It's not about Eve, it's about using the game to emotionally torture vulnerable people, and at that, I must opine, you are quite talented." obligatory CODE ALWAYS WINS :D Keep up the good work. You kidding me? This is more entertainment than the zoo, and its free. "Quoting myself from elsewhere in the same comments"
Hey Veers, go shoot some pods for the contest. Someone poke George and ask him to toss in a golden pod to the prize pool. If someone pops Gevlon, Dinsdale, Liberty, Mine Teck, or Ripard and places with the kill, I'll sing a song of the winner's choosing. Who might your alts be? Since AT cowardly tucked their tails and ran from the AT, codies are laughing stock auf New Eden especially highsec. People arent afraid, they taunt codies even in Pods, making fun of codies. Codie comes and shots the pod, but gets still gets concorded. Costs of the Pods? Nothing. "and the code acclaimed..." much blablabla and so the fairy tail for dim codie boys came to an end. seriously, in the light of this AT, code wrote history. 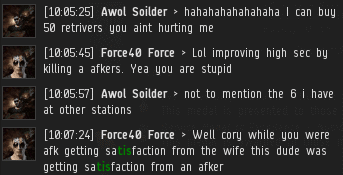 codies proven themself the biggest cowards in EvE, better as any Antiganker could have done! In these lights those stories at theses pages sound more and more rediculous and the childish nature of that kids come to the light. lets just look at those childish belvar trolls. You simpletons actually get off on this? More whining. Your tears nourish me.